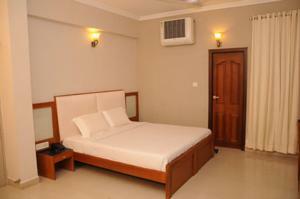 Hotel Pearl International provides simple, air-conditioned rooms with en suite bathroom in Chennai’s city centre. It is located 1 km from Chennai Central and Egmore Railway Station and offers free Wi-Fi in the entire property. The rooms are spacious and equipped with a flat-screen TV, a telephone and free toiletries. A safety deposit box and a fridge are provided on request. 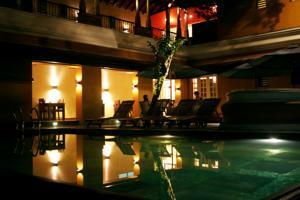 The hotel is about 15 km from Chennai International Airport and 7 km from Koyampedu Bus Station. Jawahar Lal Nehru Stadium is only a 5-minute walk away. The hotel’s tour desk organises visits to popular tourist attractions. Pearl International Hotel provides car rental facilities for guests’ convenience. Other services include laundry, currency exchange and luggage storage facilities at the 24-hour front desk. Pearl Restaurant serves a variety of Indian, Chinese and European dishes. Meals can be enjoyed in the comfort of guests’ rooms. Free! One further child under 10 years stays free of charge when using existing beds. One child under 2 years is charged INR 250 per night and person in a child's cot/crib. One older child or adult is charged INR 250 per night and person in an extra bed. Maximum capacity of extra beds/children's cots in a room is 1. Supplements will not be calculated automatically in the total costs and have to be paid separately in the hotel.